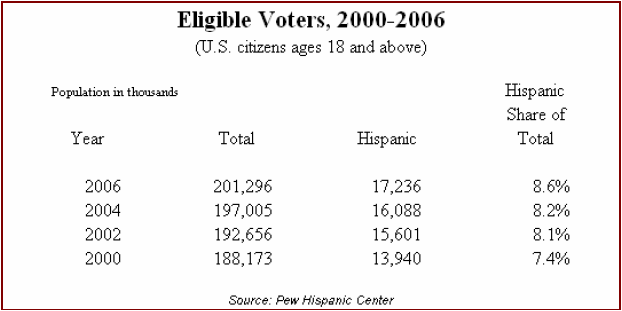 This fact sheet presents estimates for the number of Hispanics who will be U.S. citizens and at least 18 years old and thus eligible to vote as of November 2006. Also presented are estimates of the number of eligible voters who will have registered to vote based on several scenarios that weigh changes in the population and potential levels of political participation. The fact sheet includes tables on Hispanics and their eligibility to vote by state, congressional district and nationwide. The Pew Hispanic Center estimates that more than 17 million Hispanics will be U.S. citizens over the age of 18 and thus eligible to vote in the November 2006 election, an increase of 7% over the 2004 election. The Hispanic share of the U.S. electorate will increase to 8.6% from 8.2% in 2004. Estimates of the size of the Hispanic electorate for states and congressional districts are in the appendix tables. See the methodology section for a description of the data sources and methods used to develop the estimates. The terms Latino and Hispanic are used interchangeably. The terms white, black and Asian refer to non-Hispanics. 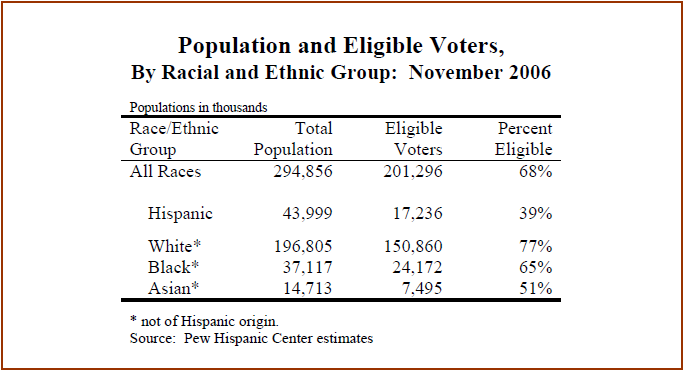 For a full discussion of the demography of the Hispanic electorate see “Hispanics and the 2004 Election: Population, Electorate and Voters” Pew Hispanic Center, June, 2005. The native born constitute the largest share of the Hispanic electorate, an estimated 12.9 million eligible voters, or 75% of the total. Naturalized citizens (the foreign-born who have acquired U.S. citizenship) are estimated to number 4.3 million, or 25% of the total. The fastest growth in the Hispanic electorate is from native-born Latinos, specifically those in the second generation (U.S. born with at least one foreign-born parent). The number of second-generation Latinos of voting age grew by about 524,000 between 2004 and 2006, accounting for 46% of the increase in the Hispanic electorate. The number of naturalized citizens of voting age increased by 317,000, or 28% of the growth. 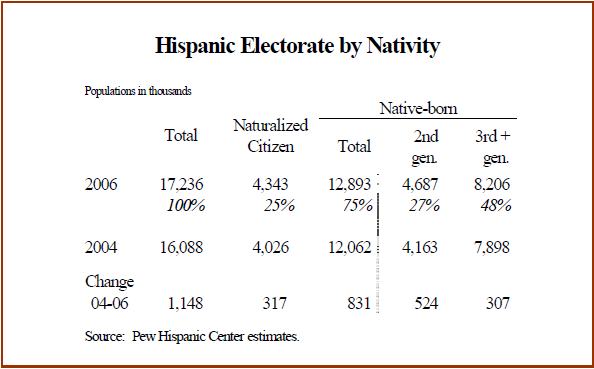 Latinos in the third plus generations (U.S. born of U.S-born parents) account for the largest nativity category in the Hispanic electorate (48%) but the smallest share of the growth. Eligible voters make up a significantly smaller share of the Hispanic population than in other racial/ethnic groups because so many Latinos are either adults who are not citizens or citizens who are not yet of voting age. For example, 39% of Hispanics are eligible voters compared to 77% of whites and 65% of blacks. Registration rates vary by age. Young adults of all racial and ethnic groups are less likely to register and less likely to vote than persons who are middle aged and older. Registration rates also vary between native-born and naturalized citizens. Native-born citizens generally have higher rates of participation in elections. However, among Latinos the difference between native and foreign born is not significant. Assumes that Latinos of different age groups and nativity categories will register at rates seen in 2002, the last mid-term election. At that election, 8.2 million Latinos registered, or 53% of eligible Latino voters, according to the 2002 Current Population Survey. The registration rates for blacks and whites were 63% and 69% respectively. If Latinos registered at the same rates as in 2002, then 9.2 million Latino citizens 18 and older would register to vote in 2006. That would represent 53% of eligible Latinos. If Latinos registered at the same rates as non-Hispanic blacks did in 2002, then 10.3 million Latinos would register to vote in 2006. That would represent 60% of eligible Latinos. If Latinos registered at the same rates as non-Hispanic whites did in 2002, then 10.9 million Latinos would register to vote in 2006. That would represent 63% of eligible Latinos. Assumes that Latinos of different age groups and nativity categories will register at rates seen in 2004. At that election, 9.3 million Latinos, or 58% of eligible voters, were registered, according to the 2004 Current Population Survey. The registration rates for blacks and whites were 69% and 75% respectively. If Latinos registered at the same rate as 2004, then 10.0 million Latino citizens 18 and older would register to vote in 2006. That would represent 58% of eligible Latinos. 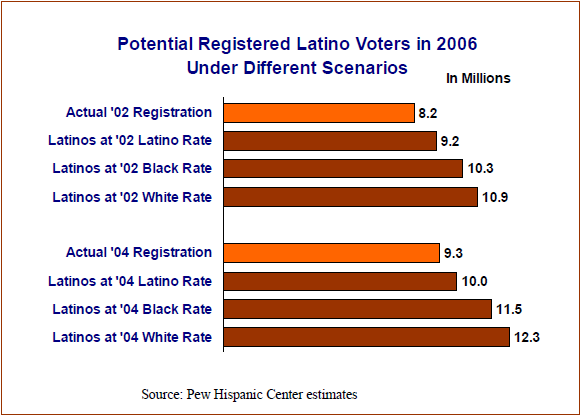 If Latinos registered at the same rate as non-Hispanic blacks did in 2004, then 11.5 million Latinos would register to vote in 2006. That would represent 67% of eligible Latinos. If Latinos registered to vote at the same rate as non-Hispanic whites did in 2004, then 12.3 million Latinos would register to vote in 2006. That would represent 71% of eligible Latinos.